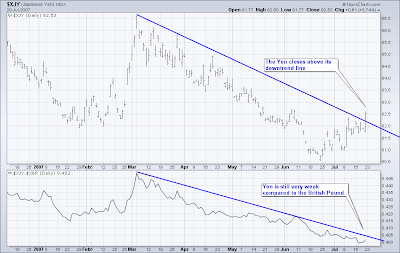 On Friday the Japanese Yen rallied above its downtrend line and closed above it. Many of you have been asking me if I have any thoughts on the Yen and all I can say is that I don't see any low risk trades. Maybe the Yen is just playing catch up with the other currencies or maybe this is the beginning of something. I think I'd rather look for a place to short the Yen if anything. If you look in the lower pane you can see that the Yen is still much weaker than the British Pound and the ratio is still below its downtrend line. I'm leaving the Yen alone for now. To me, it looks like yen is ready to be subjected to the periodical unwinding of curry trade. Who knows of what intensity.